I love heart shaped stones. On the many walks we take on the beach as a family, I always have my eye out for them, as do all my boys…seeking out treasure for mummy! When we find one, its like a little touch from heaven, a smile from God. One day last year Jon and I were chatting and praying as the boys ran on ahead, seeking God for our future, when Jon found the stone in the picture. I never noticed at the time, but as you can see it has what looks like a scan photo in the middle. In light of what we had been praying it was very poignant. Not planning on having any more children we thought maybe this was a ‘spiritual baby’. A picture of the vision that was growing within us. Time passed by and the stone became just one in the pile. 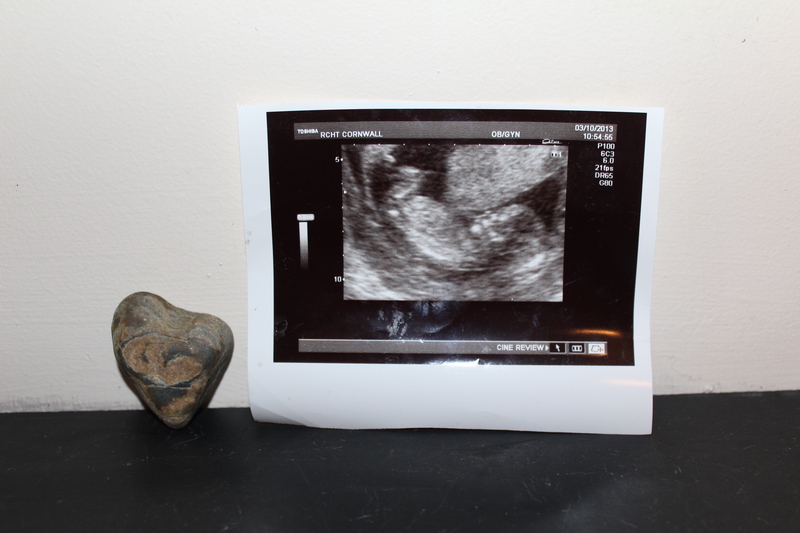 I had an extra scan last week, and looking at the photo one evening I couldn’t shake the sense of familiarity…..then I remembered the stone. Fetching it and setting them side by side, I was amazed by the similarity. It has been a hard, dry time for me spiritually over the last few months, connecting with God has been a struggle. Yet in that moment I was reminded of Gods faithfulness and the unending ways He can speak hope into our hearts, when we keep them open to Him. In a moment my soul and faith were refreshed. He had never taken His hand off me. It can be hard to find solid, regular quiet times in the busyness of being a mum. But remember God can speak hope and life into your heart in a myriad of amazing ways. Be it a song, a friend, a precious moment with your child, a sunrise…..even a heart shaped stone! He stands at the door of our hearts and knocks, so be ready and expectant to let Him in and speak to YOU….